Favorite Sweet Potato Dish: So tough! I love everything with sweet potatoes! Maybe my sweet potato blueberry bread. Why I became a Sweet Feet Member? Simple, because I love sweet potatoes and running – no brainer 🙂 I also thought it would be fun to be part of a similar minded team! 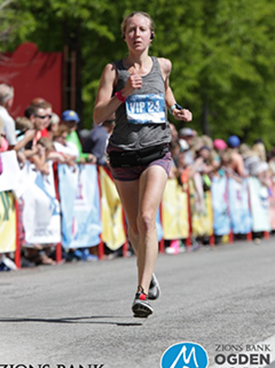 Favorite Race: The Ogden Marathon because it is beautiful, mostly downhill, and I qualified for Boston! A little about me: I am a Registered Dietitian and freelance writer in the Charlotte area. I am also a new mom, runner and blogger for Bucket List Tummy. I love to talk about nutrition, running, and share healthy recipes on my blog. In my free time, I can be found running on the trails, planning our next travel excursion, entertaining our needy golden doodle, or trying a new restaurant.